We’d love your help. Let us know what’s wrong with this preview of Callie's Second Chance for Love by Allie Kincaid. She’s loved and lost but can a new man in her life persuade her to take another chance at happily ever after? Dr. Callie Parker is many things—a successful physician, a widow and loving single mother. Her medical practice is thriving, so she hires help in the form of a handsome, big-city doctor. She has no intention of getting attached, but why does her new colleague hav She’s loved and lost but can a new man in her life persuade her to﻿ take another chance at happily ever after? Dr. Callie Parker is many things—a successful physician, a widow and loving single mother. Her medical practice is thriving, so she hires help in the form of a handsome, big-city doctor. She has no intention of getting attached, but why does her new colleague have to be so nice... and so good-looking? The attraction between Robert and Callie grows as they spend more time together, but Callie finds it difficult open her heart again. If she takes a chance on him, will he leave if a better offer comes around? Robert has a choice to make when he’s offered his dream job—return to the city and the life he’d planned or stay in Sanders Corner with the woman he loves. To ask other readers questions about Callie's Second Chance for Love, please sign up. Charlie's Second Chance for Love: A Sweet Small-Town Romance is the first book in the series Sisters in Bloom written by Allie Kincaid. It's no secret that I'm a sucker for sweet, clean Small-Town romances. Thankfully this book did not disappoint. Allie Kincaid has brought her readers to Sanders Corner, North Carolina. This gorgeous town where everyone knows everyone. A place where everyone looks out for each other. A quirky little town, with a mayor named Grannie. 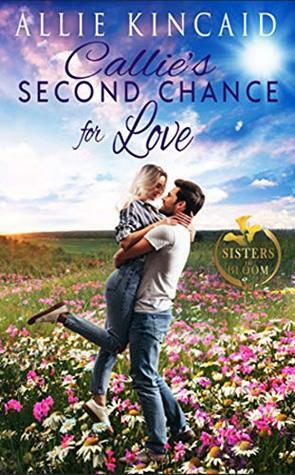 How can you not already have yo Charlie's Second Chance for Love: A Sweet Small-Town Romance is the first book in the series Sisters in Bloom written by Allie Kincaid. It's no secret that I'm a sucker for sweet, clean Small-Town romances. Thankfully this book did not disappoint. Allie Kincaid has brought her readers to Sanders Corner, North Carolina. This gorgeous town where everyone knows everyone. A place where everyone looks out for each other. A quirky little town, with a mayor named Grannie. How can you not already have your bags packed and ready to move to Sanders Corner?!? Callie Parker had always dreamed to run the town's medical clinic with her husband & raise her kids in Sanders Corner. She would be living her dream if her husband hadn't died. Now she's exhausted all the time and barely able to spend time with her son Ash. The town needs another doctor, which Grannie found in Robert Jameson. Dr. Jameson is a big city doctor from Atlanta who has high aspirations in oncology. Sanders Corner is just a stepping stone for him. Slowly Robert finds himself getting drawn into small-town life. Callie starts to see a future with Robert. That is until the day she overheard a phone call between Robert and an oncologist from Atlanta. Suddenly the future looks different. But Callie doesn't know the half of it and there's a big decision to make. I know that Allie Kincaid is newer to this genre of romance writing. Yet I have to say I am overly impressed with what she's written so far! Charlie's Second Chance for Love is by far my favorite. So far. There was definite character growth. I loved watching as each one of them overcame challenges. Callie had to overcome her husband's death and face the future. Robert was my favorite character from a growth point. Robert came from a different small-town but had desired to live in a big city. Everything he has done to this point was with the goal of being an oncologist. He never planned to enjoy Sanders Corner. He definitely never thought he'd find love there either. Allie Kincaid did such a great job showing so clearly who these two were in the beginning, as well as how they changed and developed throughout the book. We need to also remember that this is the first book. The stage has been set for the next 3 books. We have bern introduced to Holly, Aster, and Mari - Callie's sisters and the heroines for the other books. We got a good look at their characteristics. We also had a chance to meet a lot of the people that make up the population of Sanders Corner. I can't wait to see who we meet next and who are heroines will be falling in love with!!! And while I know the series is about the Bloom sisters.... I think our sweet Grannie and her boyfriend Walter deserve a book too! Small town physician Callie, the heroine, is taking on too much at work as the only doctor at her clinic, so she hires a relatively new doctor to assist. He gets into town early and, immediately has to help a town resident with a minor injury. Callie is a little put out by this; she's going to have a hard time giving up control of the patients who are her neighbors and friends in this small town. Callie's a widow with a young son whom she hasn’t had much time for as she is so busy with her job. Small town physician Callie, the heroine, is taking on too much at work as the only doctor at her clinic, so she hires a relatively new doctor to assist. He gets into town early and, immediately has to help a town resident with a minor injury. Callie is a little put out by this; she's going to have a hard time giving up control of the patients who are her neighbors and friends in this small town. Callie's a widow with a young son whom she hasn’t had much time for as she is so busy with her job. Robert, the new doctor, wanted to go into oncology but didn't get the position he wanted, so he figured he could cool his jets in a small town for a short while until he could get the job he wanted. As he and Kelly get to know each other, they find themselves more and more attracted to each other. Will Callie be able to open her heart again, especially when she knows that Robert never planned to stick around? Will Robert want to stay if he finds the woman of his dreams? Which is more important, his dream job or the potential love of his life? I've been a nurse in a hospital, and I have had a nephew who went to medical school, so I found some of these depictions of medicine to be inaccurate. Callie is a dedicated physician, and she interacts with her patients in ways that you just don't see the small town (even though it would be awesome if you did). I lived in a town the same size as this fictional one, and our medical system was nothing like this. Also, the timing described for medical school and a residency with a specialty didn't seem quite right. An oncology doctor would be unlikely to take a general practitioner job; even if he didn't get his ideal position, he would still most likely look for something in his field. A small town practice, too, might pass over such a specialist, no matter how desperate they are. Despite that, as a romance, it was still an enjoyable read. Callie Parker and her husband dreamed of moving back to home to Sanders Corner, practicing family medicine and raising a family once they finished medical school. Instead, Callie has found herself back home as the small town’s only doctor. Overworked, a widow who lost her young husband to cancer and mom to a six year old son. Robert Jameson’s dream was to escape the small town he was raised in and practice Oncology in a large hospital. After years of specialty training he had been considered the Callie Parker and her husband dreamed of moving back to home to Sanders Corner, practicing family medicine and raising a family once they finished medical school. Instead, Callie has found herself back home as the small town’s only doctor. Overworked, a widow who lost her young husband to cancer and mom to a six year old son. Robert Jameson’s dream was to escape the small town he was raised in and practice Oncology in a large hospital. After years of specialty training he had been considered the top candidate until burn out and one tragic error took him out of the running. With encouragement from his mentor, he interviewed for the physician opening with the Mayor of Sanders Corner and was offered the position believing it would be a temporary job and a boost to his resume. Callie and Robert’s first meeting got off to a bad start in front of the local townspeople. Callie couldn’t believe the new doctor with his big city ways was going to stick around long, Robert wants to get back to practicing what he trained for, but their hearts had other ideas. Add in a meddling Mayor/granny, a six year old boy with stars in his eyes, and a dog. A great, sweet story about finding love. This is book one in a new series and it's laid the foundations well. You feel that you could step into Sander's Corner and not only would you feel welcome, you would want to stay. I felt for Callie; the loss she had felt and the struggles she faced daily as the only town doctor and a single mum. Robert for me was a man who was in need of healing, the question would be what would he do once he was healed? Stay or go? Max was a great character who stole scenes and made me smile. I am looking forwa This is book one in a new series and it's laid the foundations well. You feel that you could step into Sander's Corner and not only would you feel welcome, you would want to stay. I felt for Callie; the loss she had felt and the struggles she faced daily as the only town doctor and a single mum. Robert for me was a man who was in need of healing, the question would be what would he do once he was healed? Stay or go? Max was a great character who stole scenes and made me smile. I am looking forward to book two. Ok, confession time. I love medical romances. Ever since I was a little girl and would read my grandma's old Harlequin novels, you know those from the fifties or sixties in which a long kiss was a graphic as it got... and a whole lot of the were medical romances. This book combines two things I love, medical romance, and small town romance.... and throw in a second chance, and it is a winner! I received a free copy of the sweet romance novel Callie's Second Chance For Love by Allie Kincaid and this review was given freely. A nice balance of irony, poignancy, humor, small town life and romance. Small town single mom Doctor Callie Parker opens herself up to love and change when the Mayor aka her matchmaking grandmother hires the conflicted oncologist Robert Jameson to be her partner. This novel is emotion packed with a happy ending and contains an introductory tease for a sequel. Robert is looking for a quiet place to practice medicine until a new position in oncology in a big hospital come see along. Callie is struggling to rise his son anspd keep the clinic working in her little hometown, Sanders Corner. CAn Callie have a second chance in love after losing his husband? Can Sanders Corner and their people make Robert realise that these isn’t where he belongs? Robert and Callie deserve a happy ever after. I received an ARC of this book via Bookfunnel and I'm voluntarily leaving my review. A wonderful, feel good romance. This is book one in a series and I can't wait to read more from this series. Wonderfully written and a great introduction to the series. I loved reading this book as the story is enjoyable and has a great story line with a second chance at love. A book you won't want to put down until you finish it. This is my voluntary review of an ARC of this book. What a great introduction to the town of Sanders Corner and to the Scott sisters, and to Grannie. The story flowed well, the characters well done. The angst was just enough to want to keep reading. This is a second chance at love with Doctors Callie and Robert. Callie is a widow raising her son all the while trying to run her clinic by herself until she brings in Robert to help out. Robert wants to return to the big city but the more time he spends with Callie he just maybe changing his mind. A small-town romance between two doctors and second chances. The story has a nice flow; the main and secondary characters are well written, all in all, is a good start for a series. There's humor, irony, romance, it's poignant and gives a nice portrait of small-town life. This is the first book in the Sisters in Bloom Series. A sweet small town romance between two Doctors. Callie and Robert will grab your heart as they work through their romantic feelings and she struggles with learning to love again. I read an advance reader copy and voluntarily chose to review. The book is a good sweet small town romance read. The story has a good story line. The characters are good, and they have good chemistry. The story is an enjoyable second chance at love read. This is a good story. The way you have your future mapped out in your head is not always the way it will work out. You have to be willing to really listen to your heart. This is a sweet romance story about two doctors who fall in love. Callie lost her first husband to cancer and this book is all about her second chance for love.